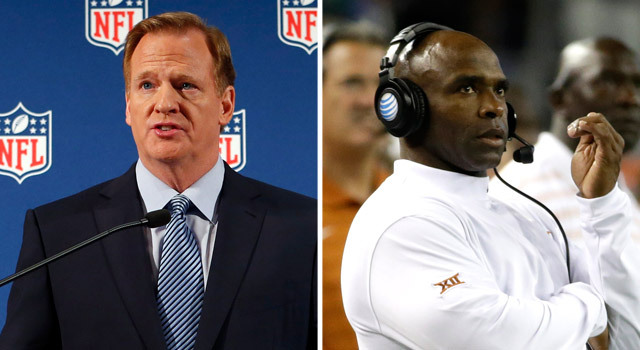 NFL Commissioner Roger Goodell met with Texas coach Charlie Strong to discuss his core values. Charlie Strong is always an early riser, but recently found a high-profile meeting on the docket instead of film review. The Texas head coach met with NFL Commissioner Roger Goodell and NFL Executive VP of Football Operations Troy Vincent in Austin on Sunday morning. "This morning, (Goodell) and I met with (coach Strong) to discuss core values, game integrity, and college relations. Great meeting, great input," Vincent tweeted. 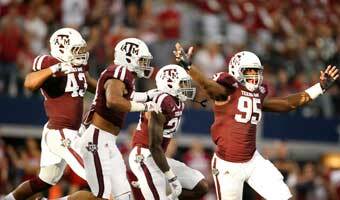 "(Strong's) emphasis on character and respect over talent is molding the next generation of football talent. Standards are key. Commissioner and I are focused on strengthening relationships with colleges. Thank you for your time today (Charlie Strong)." In the wake of a number of high profile domestic violence cases, the commissioner spent about three hours on Saturday night at the National Domestic Violence Hotline in Austin. Vincent was also reportedly in attendance, and later met with NFL alumni in the area about various issues according to his Twitter account. Strong's Longhorns returned home late Saturday night after shutting out Kansas on the road for the new coach's first Big 12 win. The 54-year-old has a well-regarded reputation not just for his acumen on the football field but for running a clean program. His core values -- Honesty, treat women with respect, no drugs, no stealing and no guns -- have been a staple of his time at both Texas and Louisville, and held up as an example for many others. Strong has already dismissed 10 Texas players from the team for failing to live up to those standards. Based on talk from the commissioner and others around the league, Strong may not be the only college coach executives meet with in the near future but he certainly is a good start as the league tries to address the issues it faces.